Varico Ltd supply 4mm & 10mm twinwall, 16mm triplewall and 25mm, 32mm & 35mm multiwall polycarbonate roofing sheets in the UK. 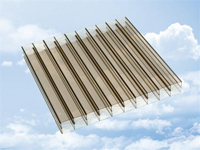 Twin wall polycarbonate is mainly used as a greenhouse and roofing material, 16mm Triplewall, 25mm Multiwall, 32mm Multiwall and 35mm Multiwall are mainly used in roofing applications such as conservatory roofs. Polycarbonate is an ideal roofing product. It is very easy to install, low maintenance, strong and cost effective. 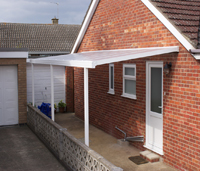 Its many applications include lean to roofs, car ports, smoking shelters, canopies, pergolas and conservatory roofs. Installation is quick and easy making it ideal for DIY projects and the trade alike. 10mm thick twinwall polycarbonate, 16mm triplewall polycarbonate and 25mm, 32mm and 35mm multiwall polycarbonate roofing is available in clear, bronze or opal tints. It is available in lengths of 1500mm, 2000mm, 2500mm, 3000mm, 3500mm, 4000mm, 4500mm, 5000mm, 5500mm, 6000mm and 7000mm, and widths of 700mm, 1050mm, 1220mm and 2100mm. We have a full range of technical literature available for our polycarbonate sheets which explains U-Values, Light Transmission and Fire Ratings - please contact us for more details. 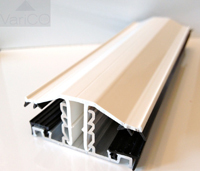 We also supply a full range of rafter supported and self supported glazing bars along with polycarbonate end closure, PVC f-section and fixing buttons to complete your project. We also supply the Evolution Canopy System for carports and canopies. If your project is a canopy or carport the Evolution Canopy is considered the best canopy system on the market today. Click the link above of the carport to link to our Evolution Canopy page. 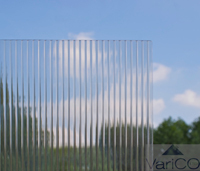 Varico Ltd are based in Aldridge West Midlands and offer national deliveries within the UK. Areas supplied include: Bedfordshire, Berkshire, Bristol, Buckinghamshire, Cambridgeshire, Cheshire, Cleveland, Cornwall, Cumberland, Cumbria, Derbyshire, Devon, Dorset, Durham, East Suffolk, East Sussex, Essex, Gloucestershire, Greater London, Hampshire, Hereford and Worcester, Herefordshire, Hertfordshire, Humberside, Kent, Lancashire, Leicestershire, Lincolnshire, London, City Of London, Merseyside, Middlesex, Norfolk, Northamptonshire, Northumberland, North Humberside, North Yorkshire, Nottinghamshire, Oxfordshire, Rutland, Shropshire, Somerset, South Humberside, South Yorkshire, Staffordshire, Suffolk, Surrey, Sussex, Tyne & Wear, Warwickshire, West Midlands, Westmorland, West Suffolk, West Sussex, West Yorkshire, Wiltshire, Worcestershire and Yorkshire.